They had one thing in common: they all believe Trudeau is not a progressive. OTTAWA — Four NDP candidates faced off Sunday in the party’s first leadership debate in Ottawa. 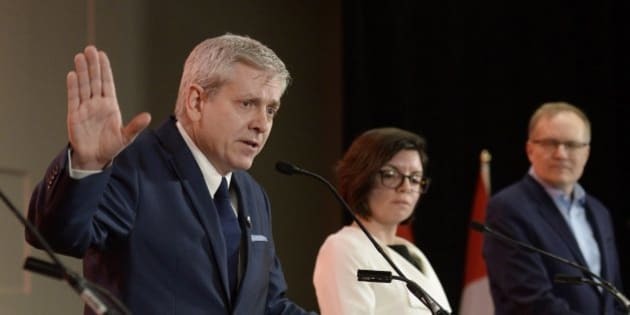 There was much agreement on stage but a few points of a disagreement did emerge as MPs Peter Julian, Charlie Angus, Guy Caron and Niki Ashton vied for support from members. 1. What role should the NDP play? Ashton wants the NDP to be more than a party that seeks power. Julian agrees with her but Angus and Caron are not satisfied with the NDP only being the conscience of Parliament. 2. Everyone wants to reduce income inequality and mitigate climate change, but they don’t agree on how to get there. Julian is opposed to any new raw bitumen pipelines but Angus says change has to be gradual. Angus and Caron also praised the Alberta NDP government’s action on climate change while Julian and Ashton did not. Caron said the party lacked empathy in the 2015 election when it opposed a ban on niqabs during citizenship ceremonies and should have communicated its message better. He wants the leadership candidates to discuss “identity” questions that might be seen differently in Quebec than in the rest of Canada. 4. New Democrats believe Prime Minister Justin Trudeau is not a progressive. There was unanimous agreement on this. The party asked the candidates to share everything from their favourite winter sport, favourite food as a child, favourite Quebec movie, favourite feminist. They were also asked to identify if they prefer ale or lager, and the book they last read. And later they were asked, in French, who their favourite opposition politician is. Caron and Angus said former Conservative MP James Rajotte, the former chair of the finance committee. Angus also listed Mike Pearson, the former Liberal prime minister, Lester B. Pearson. Ashton said she finds Conservative interim leader Rona Ambrose very dynamic. Julian listed former Quebec socialist separatist leader Françoise David as his favourite politician in another party. In another notable exchange, in French, Caron said he liked pasta with Cheez Whiz as a child. Julian liked shepherd’s pie but when he makes it, it tastes more like cement pie. Ashton enjoyed her grandma’s spanakopita (Greek filo pastry stuffed with spinach and cheese) and Angus said he liked cabbage rolls, perogies and Finnish bread.